Art and Design students are showcasing their ‘People, Places and Print’ exhibition at the Cooper Gallery. The exhibition is in response to the student’s unit ‘2D Problem Solving in Art and Design’ which saw students explore Barnsley as their subject matter and is a representation of local people and landmarks. The collection of work features different print techniques including lino cut, wood cut, collograph, etching, intaglio and mono print based works. Barnsley College’s Vice Principal of Curriculum, Liz Leek, was invited along to judge the students’ work and award certificates for the best in print. Student Hollyanne Hawkhead was highly commended for her lino cut work and fellow students Alex Dryden and Phoebe Archer came in second and third for their screen print and lino cut work. 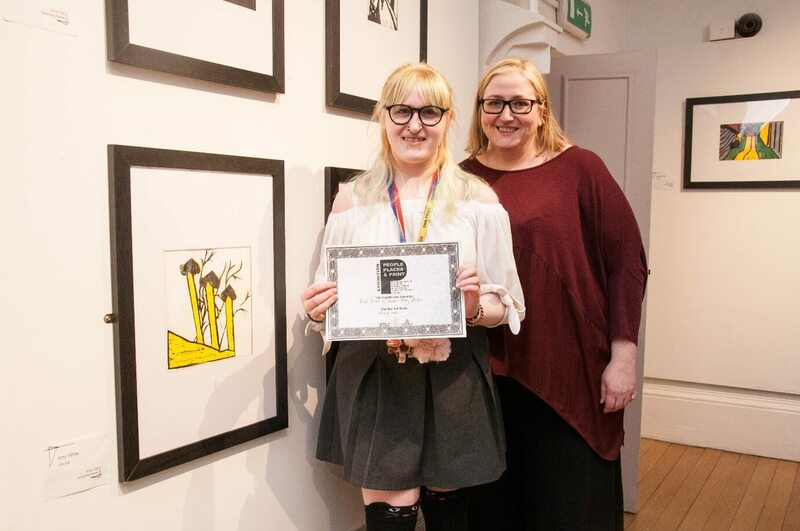 Liz was impressed with all the student work, particularly favouring Amy White’s pieces which were awarded ‘best print in show’ and have been purchased by Liz to take pride of place in her office. The People, Places and Print exhibition is on at the Cooper Gallery from Saturday 7 April to Saturday 5 May for the public to view.